In the Meadow pays tribute to El Monte’s rich history through symbolic and metaphoric imagery. The stylized treatment of forms and figures are inspired by Mexican and Chinese cut paper folk art traditions and Japanese woodblock prints, which were meant to honor farm workers. Art panels reflect icons and picturesque elements of El Monte’s past. Some art panels depict picturesque glimpses into El Monte’s idyllic, agrarian past. In another art part panel, a Chinese lion reflects the historic lions in El Monte’s famous Gay’s Lion Farm of the 1920s and 1930s. The powerful image of the lion is also the El Monte High School mascot. 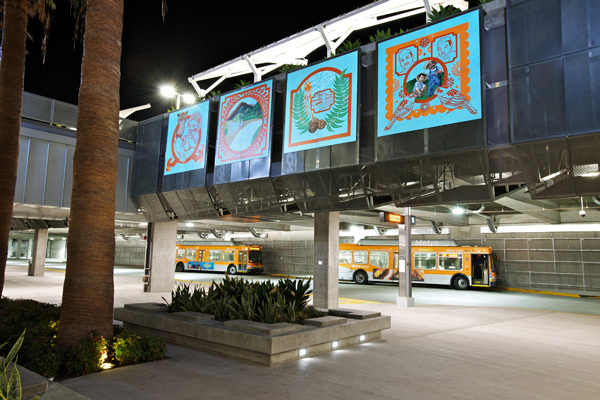 The graphic and geometric approach to the artwork is congruent with the environment and with nearby structures of El Monte Station. The station is mostly concrete and gray with angular lines and variations of square and rectangular shapes. The color palette chosen for the artwork is influenced by the colors of the plants and surrounding elements of the station such as the colors of the succulents, flowers, and draught tolerant plants throughout the station. PHUNG HUYNH is Associate Professor of Art at Los Angeles Valley College and teaches courses in drawing, painting, and design. Huynh completed undergraduate coursework at the University of Southern California, received a Bachelor of Fine Arts from the Art Center College of Design in Pasadena and earned a Master of Fine Arts from New York University. Huynh is influenced by 17th century Italian Baroque painters as well as contemporary painters who explore postcolonial, cross-cultural phenomena. Her work is a deliberate exploration of traditional Chinese auspicious imagery, and the ways it is consumed and distorted in American popular culture. 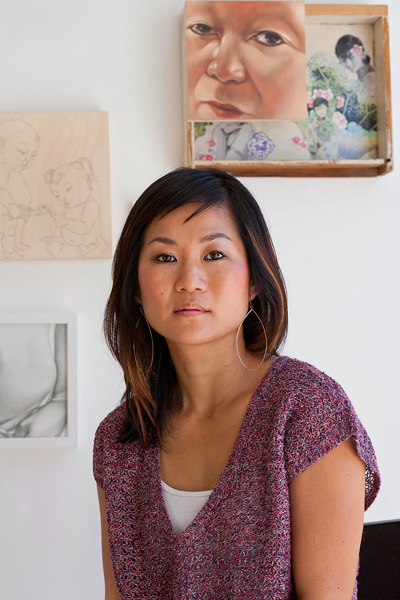 Huynh has had solo exhibitions at Sam Lee Gallery in Los Angeles, Gagosian Gallery in Beverly Hills, and the Sweeney Art Gallery at the University of California, Riverside.